This pattern was written by Marjorie Peters, the woman from British Columbia who knit a pair of Cowichan sweaters as Canada’s wedding gift to the young Prince Charles and Princess Di. She was asked to design a similar pattern for Canadian Living magazine. A reader recently requested the pattern, and it is now available online. This is a unisex pattern which includes photos. The recommend yarn has long since been discontinued, but the pattern describes it as an unspun, 100% wool bulky yarn. 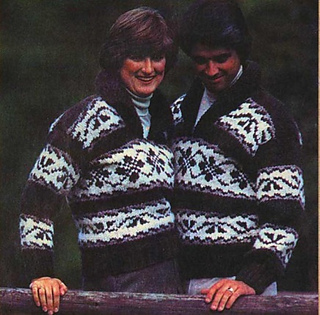 Excerpt from pattern: These sweaters have been designed as outerwear and are sized accordingly. They knit up quickly because of the bulky yarn and large needles. The pattern is easy to follow for anyone with some knitting experience. However, we do not recommend it for beginning knitters. 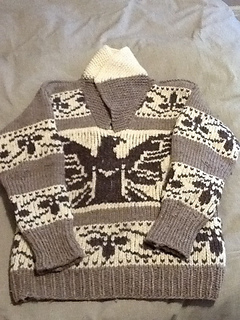 You can read more about coastal Salish women and their Cowichan sweaters here. It appears that the pattern PDF is missing the first page of the instructions.